When it comes to cleansers and oily skin, they really are the be all and end all to my routine. Regardless of what other products I’m using, if the cleanser isn’t right then nothing else really matters. I love the feeling of squeaky clean, freshly cleansed skin, it just makes me feel all shiny (thought that could be the oily skin talking) and new. 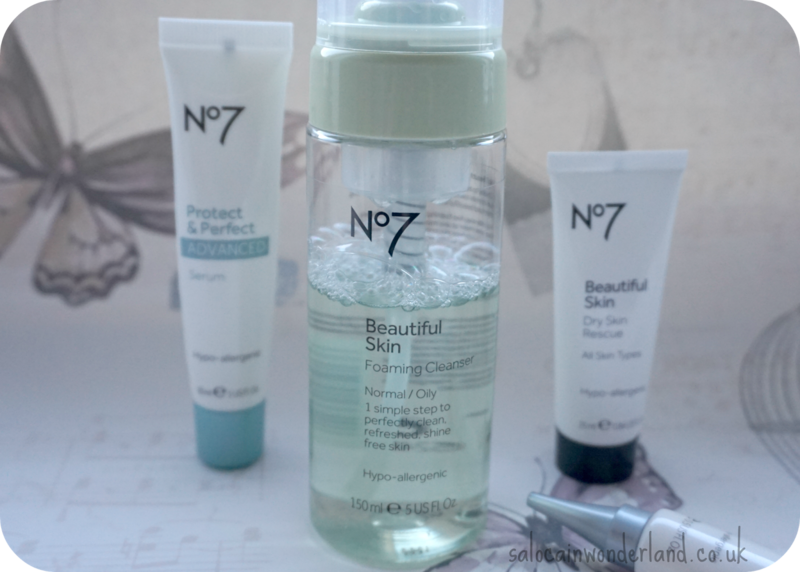 I picked up the No7 Beautiful Skin Foaming Cleanser on a bit of a 3 for 2 whim - I had two products I really wanted and needed something else to make the most of the offer, hey it would have been rude not to! Oily skin has a love/hate relationship with foaming cleansers. Sometimes, the right cleanser just works, sometimes, it’s a complete and utter disaster. I used to always go for products specifically targeted at oily skin and I actually found these made my skin worse, go figure. This cleanser is for normal to oily skin, so I was hoping it would gear towards the more normal side. Products targeted at oily skin tend to be very drying which just causes the skin to produce even more oil which in turn, winds me right up! Soap free, hypoallergenic, this foaming cleanser is designed to remove dirt, impurities, excess oil, tighten pores and remove make-up, leaving skin feeling refreshed and ready for anything. It has a mineral blend rich in multivitamins that should hydrate skin and leave you looking bright and awake. Extra added zinc should control oil production, leaving you looking less like a used frying pan. Damn. 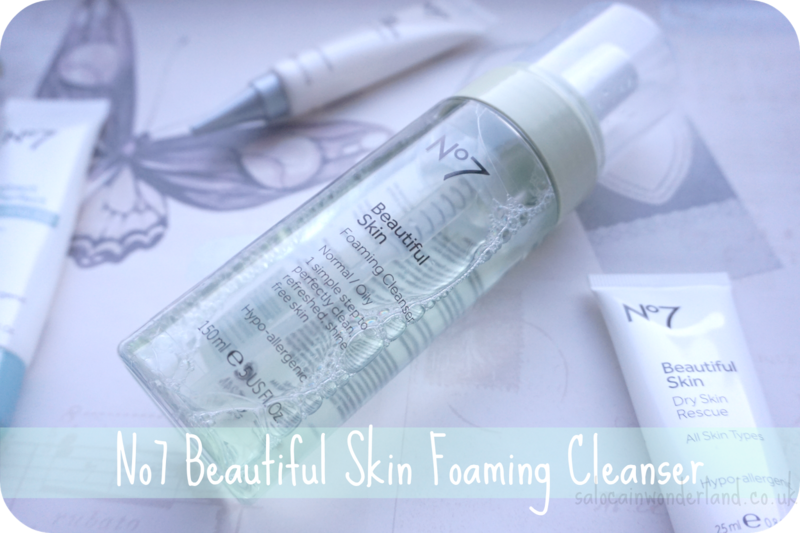 I hate to be a negative nelly, but the No7 Foaming Cleanser just hasn’t worked for me. My skin does feel fresh, smooth and tighter after use but if I don’t slap on the moisturiser within 10 minutes my skin feels uncomfortably tight and dry, especially around my chin, forehead and nose. I’ve been using it twice a day and it’s left me with a snake-skin shedding dry patch right in the middle of my forehead that makes mineral foundation impossible to wear - the foundation just clings to the shedding skin…right in the middle of my face. That’s just not a look I can rock. It also smells like bubbles. The ones you blow in summer and have the dogs chase and bite at for hours of endless amusement (don’t tell me you haven’t done this!). At first, it made me feel all nostalgic and want to run out and buy a puppy, but after about a week it just smelt very chemically. The pump also got stuck about half way through the bottle so I have to yank it back out every time I use it, now I’m just being picky. So let’s try a positive. It does leave my skin looking, and feeling, squeaky clean. My pores feel tighter and my skin doesn’t look any more or less oily as the day goes on than before I started using it. Ideally, this should probably only be used once a day, if not less, maybe 2-3 times a week, but I’m trying to not have about 10 different products on the go at once. It hasn’t caused me to breakout at all, which is a nice bonus. Would I buy it again? I doubt it. But, I will finish the bottle, it’s not all bad, it’s just not for me, and as long as I slather on the moisturiser stat, things aren’t all bad. How do you feel about foaming cleansers? Any you’d recommend? I'm not a massive fan of foaming cleansers, precisely because I equate them with a dry feeling, so I can't recommend any (sorry!). I much prefer a cleansing oil... if I actually manage to stick to my beauty routine, which I'm an absolute NIGHTMARE for! Ugggh there's nothing worse than tight skin. I find most cleansers leave me feeling that way and I have to run straight to moisture. NOT GOOD BRO.